A monorail is a railway with only one rail. The cars may hang beneath it, run on top of it (with a guide rail above or a gyroscope to keep them upright), or straddle it. The first was built in London (1824), the cars being horse-drawn. The first successful system was the Lartigue system: the cars straddled the rail and had horizontal wheels that ran on guide rails beneath. The SAFEGE system has cars hung from a box girder, split at the bottom, inside which the driving and guide wheels run. In the Alweg system the cars straddle a broad rail, on either side of which horizontal wheels run to provide stability. Monorails have been proposed as replacements for city subways. The Disney monorail is a form of public transport that operates on Disney property in Florida and California, and on Disney sites overseas. The most extensive of these monorail systems is that at Walt Disney World Resort in Lake Buena Vista, Florida. Twelve color-coded trains carry more than 150,000 guests to the Magic Kingdom and Epcot parks on an average day. The extent of the Florida system is 13.6 miles. The current fleet of Mark VI monorails has been in continuous operation since 1990-91. Each Mark VI train consists of six cars, and has an overall length of 203 feet and a capacity of 365 passengers. The track consists of 26-inch wide, pre-cast concrete beams supported by concrete columns which are approximately 50 feet apart. 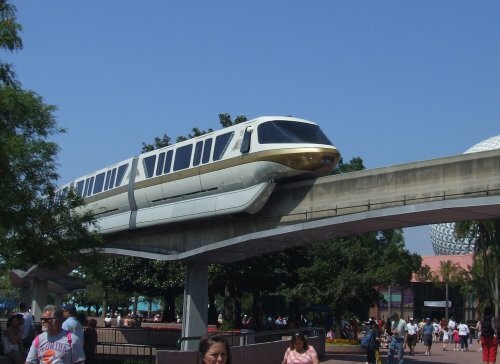 Each monorail travels on rubber tires and is powered by a 600-volt DC propulsion system which includes eight DC motors rated at 112 HP each, with electric power coming from each side of the beam.